Factor V deficiency is also known as Owren disease. Dr. Paul Owren identified this defect in Norway in 1943. Using relatively primitive technology, he was able to deduce the existence of a fifth component required for fibrin formation, which he named factor V, thus beginning the era of Roman numerology for coagulation factors. 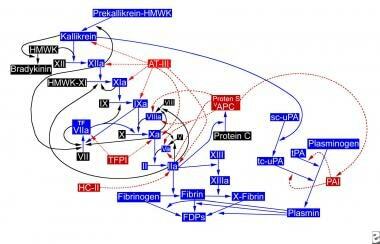 Factor V is an essential component in the blood coagulation cascade. Factor V is synthesized in the liver and possibly in megakaryocytes. Factor V circulates in an inactive form. During coagulation, factor V is converted to the active cofactor, factor Va, via limited proteolysis by the serine protease a-thrombin. Factor Va and activated factor Xa form the prothrombinase complex. The prothrombinase complex is responsible for the rapid conversion of the zymogen prothrombin to the active serine protease a-thrombin. [5, 6] Thrombin cleaves fibrinogen to form fibrin, leading to the ultimate step in coagulation, the formation of a fibrin clot. See images below. Cell surface-directed hemostasis. 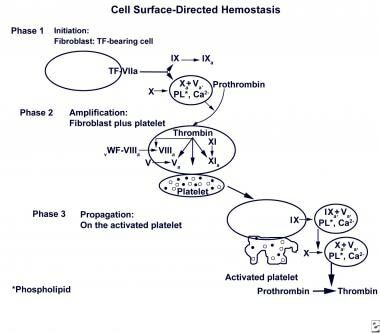 Initially, a small amount of thrombin is generated on the surface of the tissue factor (TF)–bearing cell. Following amplification, the second burst generates a larger amount of thrombin, leading to fibrin (clot) formation. Adapted from Hoffman and Monroe, Thromb Haemost 2001, 85(6): 958-65. Factor V Leiden is a completely different inherited disorder that involves a single point mutation in the factor V gene. Factor V activity levels in patients with factor V Leiden are normal. Proteolytic inactivation of factor Va and factor VIIIa by activated protein C (APC) normally limits clot formation; however, factor V Leiden resists inactivation by APC. Consequently, individuals who are homozygous for factor V Leiden have a high incidence of thrombosis. For more information, see Hereditary and Acquired Hypercoagulability. Fewer than 200 cases of congenital factor V deficiency have been reported worldwide since 1943. Homozygous factor V deficiency is rare, occurring in approximately 1 per million population. Delev et al presented 39 German patients with factor V deficiency. In 36 cases with an identifiable causative mutation, 20 patients were heterozygous for the mutation, whereas 9 were homozygous, 6 were compound heterozygous, and 1 proband was pseudohomozygous. There were no mutations found in the remaining 3 patients. The investigators identified 33 uniquely different mutations of a total 42 genetic mutations: 19 missense mutations, 8 nonsense mutations, 4 small deletions, and 2 splice site mutations. Of the 33 unique mutations, 23 were novel sequence variations not previously reported, and all changes found in exon 13 led to null alleles as nonsense mutations or small deletions. The severity of factor V deficiency varies from bruising to lethal hemorrhage. No apparent racial predilection for factor V deficiency exists. Factor V deficiency affects males and females with equal frequency. Factor V deficiency affects persons of all ages. The age at presentation indirectly varies with the severity of disease. Thalji N, Camire RM. Parahemophilia: new insights into factor v deficiency. Semin Thromb Hemost. 2013 Sep. 39(6):607-12. [Medline]. Quek JKS, Wong WH, Tan CW, Tha MH, Nagarajan C, Lee LH, et al. Acquired factor V deficiency in a patient with myeloma and amyloidosis. Thromb Res. 2018 Apr. 164:1-3. [Medline]. Owren P. Parahaemophilia: haemorrhagic diathesis due to absence of a previously unknown clotting factor. Lancet. 1947. Vol I:446-8. Duckers C, Simioni P, Rosing J, Castoldi E. Advances in understanding the bleeding diathesis in factor V deficiency. Br J Haematol. 2009 Jun. 146(1):17-26. [Medline]. Asselta R, Peyvandi F. Factor V deficiency. Semin Thromb Hemost. 2009 Jun. 35(4):382-9. [Medline]. Cramer TJ, Gale AJ. The anticoagulant function of coagulation factor V. Thromb Haemost. 2011 Nov 24. 107(1):[Medline]. Ni Ainle F, Preston RJ, Jenkins PV, et al. Protamine sulfate down-regulates thrombin generation by inhibiting factor V activation. Blood. 2009 Aug 20. 114(8):1658-65. [Medline]. Delev D, Pavlova A, Heinz S, Seifried E, Oldenburg J. Factor 5 mutation profile in German patients with homozygous and heterozygous factor V deficiency. Haemophilia. 2009 Sep. 15(5):1143-53. [Medline]. Liu HC, Shen MC, Eng HL, Wang CH, Lin TM. Asp68His mutation in the A1 domain of human factor V causes impaired secretion and ineffective translocation. Haemophilia. 2014 Jul. 20(4):e318-26. [Medline]. Mitterstieler G, Muller W, Geir W. Congenital factor V deficiency. A family study. Scand J Haematol. 1978 Jul. 21(1):9-13. [Medline]. Zehnder JL, Hiraki DD, Jones CD, Gross N, Grumet FC. Familial coagulation factor V deficiency caused by a novel 4 base pair insertion in the factor V gene: factor V Stanford. Thromb Haemost. 1999 Sep. 82(3):1097-9. [Medline]. Zheng C, Zhang B. Combined deficiency of coagulation factors V and VIII: an update. Semin Thromb Hemost. 2013 Sep. 39 (6):613-20. [Medline]. [Full Text]. Van den Berg SA, Verwer PE, Idema RN, Van Guldener C. Transient cefuroxime/metronidazole treatment induced factor V antibodies. BMJ Case Rep. 2014 Aug 19. 2014:[Medline]. Wang X, Qin X, Yu Y, Wang R, Liu X, Ji M, et al. Acquired factor V deficiency in a patient with a urinary tract infection presenting with haematuria followed by multiple haemorrhages with an extremely low level of factor V inhibitor: a case report and review of the literature. Blood Coagul Fibrinolysis. 2017 Jun. 28 (4):334-341. [Medline]. [Full Text]. Hamedani AG, Cole JW, Cheng Y, Sparks MJ, O'Connell JR, Stine OC, et al. Factor V Leiden and Ischemic Stroke Risk: The Genetics of Early Onset Stroke (GEOS) Study. J Stroke Cerebrovasc Dis. 2011 Nov 17. [Medline]. Girolami A, Scandellari R, Lombardi AM, Girolami B, Bortoletto E, Zanon E. Pregnancy and oral contraceptives in factor V deficiency: a study of 22 patients (five homozygotes and 17 heterozygotes) and review of the literature. Haemophilia. 2005 Jan. 11(1):26-30. [Medline]. Totan M, Albayrak D. Intracranial haemorrhage due to factor V deficiency. Acta Paediatr. 1999 Mar. 88(3):342-3. [Medline]. Sacco S, Dragani A, Davi G, Carolei A. Four recurrent intracerebral haemorrhages. Cerebrovasc Dis. 2003. 16(4):435-6. [Medline]. Satoh H, Yamashita YT, Ohtsuka M, Sekizawa K, Hasegawa Y. Pulmonary hemorrhage in factor V deficiency. Can Respir J. 1999 Jul-Aug. 6(4):320. [Medline]. Bulato C, Novembrino C, Anzoletti MB, Spiezia L, Gavasso S, Berbenni C, et al. "In vitro" correction of the severe factor V deficiency-related coagulopathy by a novel plasma-derived factor V concentrate. Haemophilia. 2018 Jul. 24 (4):648-656. [Medline]. Gavva C, Yates SG, Rambally S, Sarode R. Transfusion management of factor V deficiency: three case reports and review of the literature. Transfusion. 2016 Jul. 56 (7):1745-9. [Medline]. Passarelli PC, De Angelis P, Pasquantonio G, Manicone PF, Verdugo F, D'Addona A. Management of Single Uncomplicated Dental Extractions and Postoperative Bleeding Evaluation in Patients With Factor V Deficiency: A Local Antihemorrhagic Approach. J Oral Maxillofac Surg. 2018 Jun 21. 3(3):196-8. [Medline]. Fu YX, Kaufman R, Rudolph AE, Collum SE, Blinder MA. Multimodality therapy of an acquired factor V inhibitor. Am J Hematol. 1996 Apr. 51(4):315-8. [Medline]. Esmon CT. Basic mechanisms and pathogenesis of venous thrombosis. Blood Rev. 2009 Sep. 23(5):225-9. [Medline]. [Full Text]. Ichikawa H. Successful total gastrectomy of gastric cancer in a congenital factor V deficient patient [in Japanese]. Nippon Ronen Igakkai Zasshi. 2000 Mar. 37(3):245-9. [Medline]. Suehisa E, Kawasaki T, Toku M, Hidaka Y. Low level of factor V is associated with development of deep-vein thrombosis in Japanese patients. Thromb Res. 2009 Jun 2. [Medline].